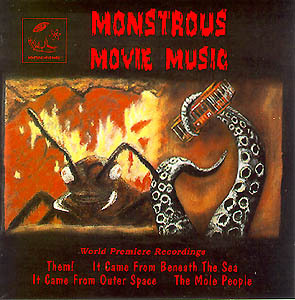 The 266th Soundtrack of the Week is this wonderful re-recording of music from The Mole People, Them!, It Came from Outer Space and, in honor of the recently deceased Ray Harryhausen, It Came from Beneath the Sea. All the music has been brilliantly performed by the Radio Symphony Orchestra of Cracow. You can read a little about this CD here. There are only three short tracks from The Mole People here, but they sound great. That's a movie I really like, too. Herman Stein is the primary composer. Bronislau Caper's score for Them! is my favorite music from that composer so far. The instrumentation and arrangements are complex and inventive, creating intense and haunting atmospheres. Herman Stein, Irving Gertz and Henry Mancini provide the cues for It Came from Outer Space. Some of it is familiar sounding but much of it is ethereal and haunting. Finally there's Mischa Bakaleinikoff's powerful score for It Came from Beneath the Sea, famous for the effects sequence in which Ray Harryhausen's stop-motion giant radioactive octopus destroys the Golden Gate Bridge. These cues are models of lean, tough writing for hard-hitting action scenes, though cues like "Love by the Sea" demonstrate Bakaleinikoff's range. Perhaps you remember how, in the 1958 movie Earth vs. the Spider, a giant tarantula goes on a rampage after being woken up by some kids rehearsing their rock and roll band. Well, it's worth noting that in the first scene of It Came from Beneath the Sea, the giant octopus attacks the submarine only after the people in the submarine change the music from laid-back Hawaiian stuff to modern jazz.